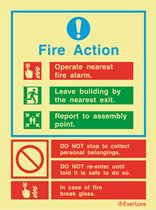 We offer a supply and install service for all types and sizes of safety signage. This includes mandatory, prohibition, warning, evacuation, safety, directional and industrial signage. For your unique requirements we also offer businesses a custom sign design and production service. All of our signage can be produced in a variety of languages. We offer a comprehensive service, taking care of everything from initial advice through to design, supply and installation. Are you using the correct safety signage? Lindum Fire Services are main dealers for Everlux safety signs, supplying only the highest quality competitively priced safety signage, that fully complies with all current UK legislation. 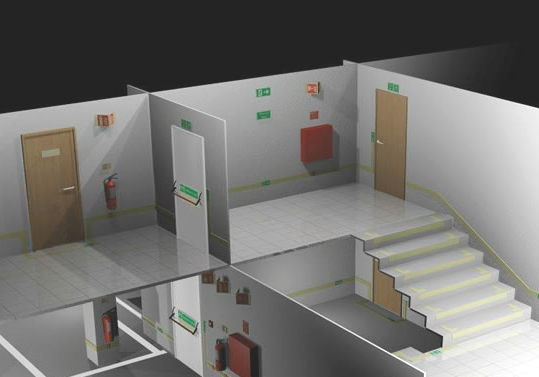 As main Everlux dealers, our staff are trained by the manufacturers in the survey and installation of fire safety signage to a very high standard. As such, you can be sure the guidance and service you receive is second to none. Regardless of the size of your fire alarm system, British Standards dictate that and alarm zone plan is required. Zone plans need to be displayed alongside all control panels and repeater panels. Lindum Fire Services offer a flexible service whereby necessary Alarm Zone Plans can be designed and installed for your new or existing fire alarm system. Please contact us for further information. "Signs must be used, where necessary, to help people identify escape routes, find fire-fighting equipment and emergency fire telephones. These signs are required under the Health and Safety (Safety Signs and Signals) Regulations 1996 and must comply with the provisions of those regulations."